The Aged Debtor report in Operate allows you to keep track of customer balances and any outstanding amounts your clients still have to pay to your organization. 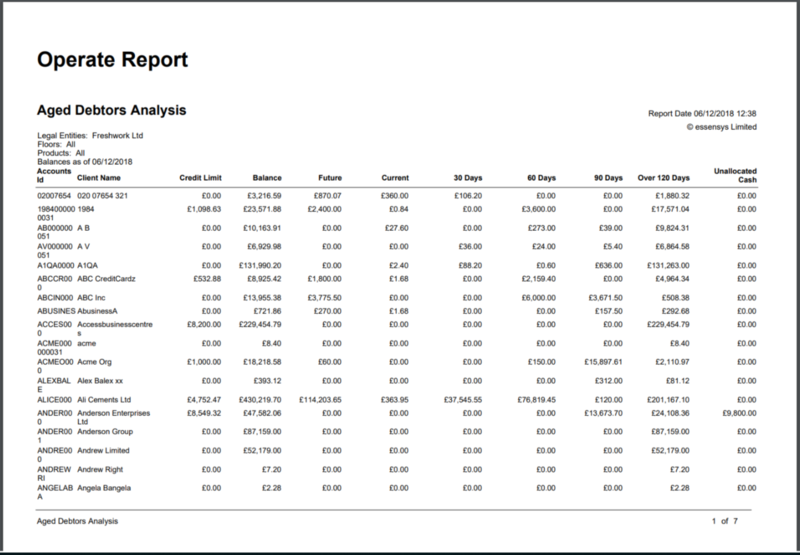 You can run this report by going to Operate's Reports section, then searching for Aged Debtors Analysis . There are several reports you can choose from (a main report, one which does not includes deposits and one which includes detailed transactions). This article focuses on the main Aged Debtors Analysis Report. 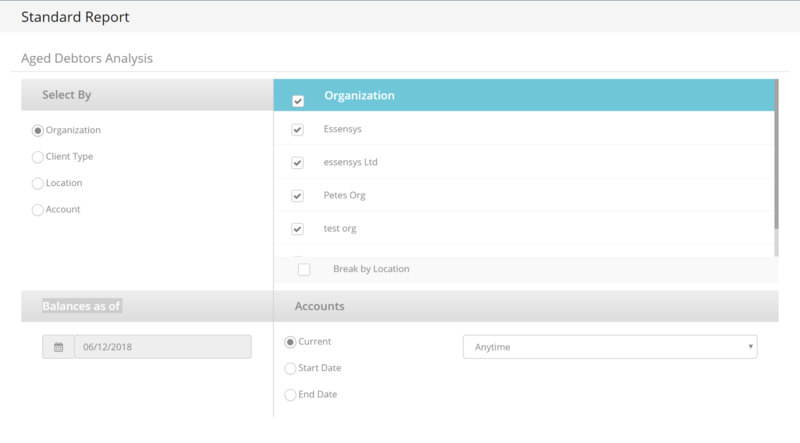 The report can be ran per Organization, Client Type, Location or Account. You can also filter Accounts by specific start and end dates, or leave all current Accounts. The Balances as of date selection allows you to choose the date up to which your client balances and payments are considered. The Aged Debtors Analysis Report pulls your customer balances as of the date you select under 'Balances as of' and breaks these down into different sub-balances, according to how old the debt is. When selecting a date e.g. 30th November, then the report will display the balance up to that period and will not include balances/payments paid after that date. Their Balance as of the date selected under "Balance as of". "Future" due payments - This looks at the due dates of any future invoices and pulls the amount due for those respective invoices. "Current" due payments - This column looks at the due dates of any current invoices, within the current billing period / month, and shows the amount due, according to the these invoices. Amounts due for more than 30, 60, 90 and 120 days - These are expresses in separate columns for each period. Each column looks at the due dates of invoices which are older than these periods, showing the due amount corresponding to each period. Unallocated cash - If a payment has been made within your Accounts Receivable, but has not been allocated to an invoice, the report will show this. You can allocate these payments by following the goide on Recording a Payment. Deleted Accounts - Operate will not allow you to delete Accounts with a balance. However, if a customer has had a debt which has been paid after the selected Balace as of date; and the Account has been deleted (with a zero balance) prior to running the report, then the Account will not be listed due to its deletion. Accounts with a zero balance - regardless of whether they have a retainer or not. For deposit specific information, you can run one of the available Exposure reports (search for "exposure" in the Reports list) This report show the total owed against the deposit held, thus showing you your exposure). For further information about working with reports in Operate, please see the Knowledge Base section dedicated to Standard Reports.